My erstwhile colleague, Matthew Hayday, has written an interesting critique of John Furlong and VANOC’s attempts to use the Québécois singer Gilles Vigneault’s song, “Mon Pays” for the 2010 Olympic opening ceremony. Except that VANOC made no attempt to contact Vigneault for permission before planning the festivities and they were left holding the bag when Vigneault refused permission. As Matthew notes, quelle surprise, Vigneault is a well-known separatist and “Mon Pays” was the song people cried in their beer to after the 1980 Referendum loss for the “Oui” side. Matthew goes on to note that Furlong demonstrated a total lack of understanding of Québec here. I have a few things to note in response. First, Matthew is bang on, deciding to use a Vigneault song for Canada’s Winter Olympics is missing the entire point of Vigneault’s long career. Second, choosing a song that was recorded in 1966 shows a devastatingly pathetic grasp on pop culture in Québec. But more to the point, the lack of understanding about Québec from some in the ROC is not all that shocking to me. I have been told many times that I speak “very good English” for a Quebecer. The most recent time being last summer when I was in Vancouver. 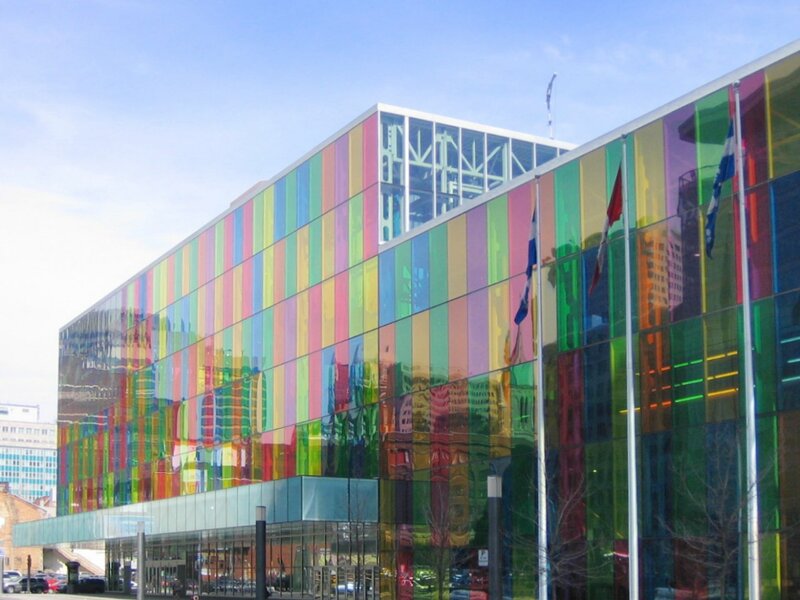 Indeed, it is impressive an Anglo-Montrealer would speak English well. Being Canadian, it sometimes feels like we’re the ones on the short end of the stick in global affairs. We’re the ones the Americans invaded during the War of Independence and again in 1812. During World War I, the British used our troops as cannon fodder in battles like the Somme. We have been colonies of the French and the British. Economically, we’re largely dependent upon the Americans. Our peoples are descendent from the colonised of the world (ok, so is the rest of the Western world). In short, I think Canadians like to see themselves as victims, or at least feel like victims far too often. This is why winning double gold medals in hockey over the Americans at the Olympics is such a big deal. For that moment, we’re the winners. A sobering thought, that song. And all the cheesy, stupid, lame-brained Molson Canadian ads in the world (apparently has more square feet of “awesomeness per person” than any other nation on Earth) can’t change it. That being said, we do have our moments, our victories, and our glories. But we tend to play those down, too (except when they involve gold medals, hockey, and the Olympics). We’re a modest people, I suppose. So all of this being said, I’m always surprised to find Canadians on the other side, at least historically-speaking. Not far from Charlemont, Massachusetts, is the town of Deerfield. On 29 February 1704, during the War of Spanish Succession, a joint force of 47 French and Canadian soldiers and 200 Mohawk warriors (including the Pocumtuck, who had lived in what is now the Pioneer Valley before the English settlers arrived) raided Deerfield before dawn. The raid was partly in revenge for the settlers’ violent and callous treatment of the Pocumtuck, which culminated in a massacre in what is now nearby Montague Township in 1676. The combined French-Canadian-aboriginal force caught the settlers unaware before dawn and massacred 56 people. 109 people survived the raid, they were captured and made to march 500km north to Québec, in harsh winter conditions. 21 of them either died or were killed during the trek. Most of those who made it to Québec were eventually ransomed and made their way back to Deerfield. A few, most notably the pastor’s daughter, Eunice Williams, chose to remain. Williams spent the rest of her life at Kahanwake, a Mohawk settlement near Montréal, marring a Mohawk man and having a family with him. The Deerfield Raid was no doubt a traumatic event for the people of the small settlement. And it has lived on for the past 300 years, it is a foundational story in the Pioneer Valley of Massachusetts. At times, listening to people describe it, reading newspaper stories about the raid, and seeing how it is represented in the pop culture of the Valley, I even get the sense that the trauma of the raid lives on. Certainly, it is strange for a Canadian to realise the Americans were victims of the colonial era. It is even more bizarre to realise that one’s ancestors were the ones who caused the trauma. We are usucally the victims, not the aggressors of historical trauma. The fact that the 1704 raid lives on in Deerfield, and is largely forgotten in Québec (as France lost that war), is significant. No doubt it lives on in part because Deerfield’s raison d’être today is as a tourist site. Historic Deerfield is a national historic site, and the town’s economy centres around the historical experience there, and the 1704 raid factors heavily into it. It is no doubt the most significant event to have occurred in Deerfield in its 337 year history. And, as a result of the historicisation of Deerfield, the 1704 raid gets played out, reinterpreted, and re-assessed almost daily by the town’s residents, the historical educators, and the tourists who come to visit. But for me, a Canadian, the first time I visited Deerfield, on a warm, sunny day in late May 2006, I was stunned to find a place that was traumatised by Canadians, at least a place that was not an aboriginal settlement/reserve. And as I took in the colonial American scene in front of me that day, I couldn’t help but feel a shudder of fear imagining that 247-man strong force crawling across the plain along the Deerfield River, coming out of the mist and the snow and laying siege to a small frontier settlement. And every time since that I have driven past, or been into Historic Deerfield, I cannot shake that feeling of terror that the colonist there must’ve felt that cold February morning 306 1/2 years ago. Years ago, I lived in Vancouver, perhaps once the greatest example of Modernist architecture in Canada, if not North America. Vancouver is the city that unleashed architect Arthur Erickson on the world. Sadly, Erickson died last spring. 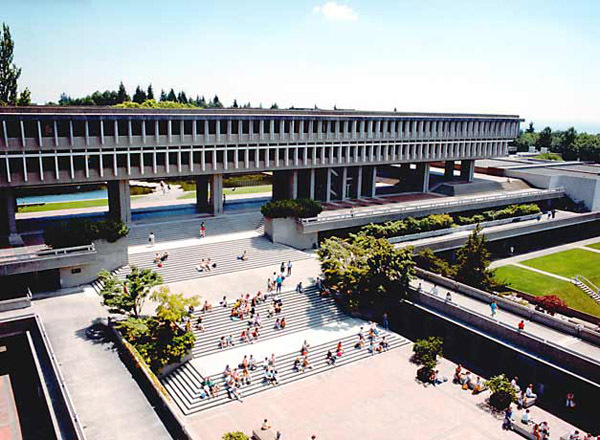 Yet, Erickson’s buildings live on in Vancouver, especially his modernist designs, most notably Simon Fraser University in suburban Vancouver (where I completed my MA), and the Canadian Embassy in DC. Indeed, one of my favourite architecture books is Rhodri Windsor Liscombe’s The New Spirit: Modern Architecture in Vancouver, 1939-1963. 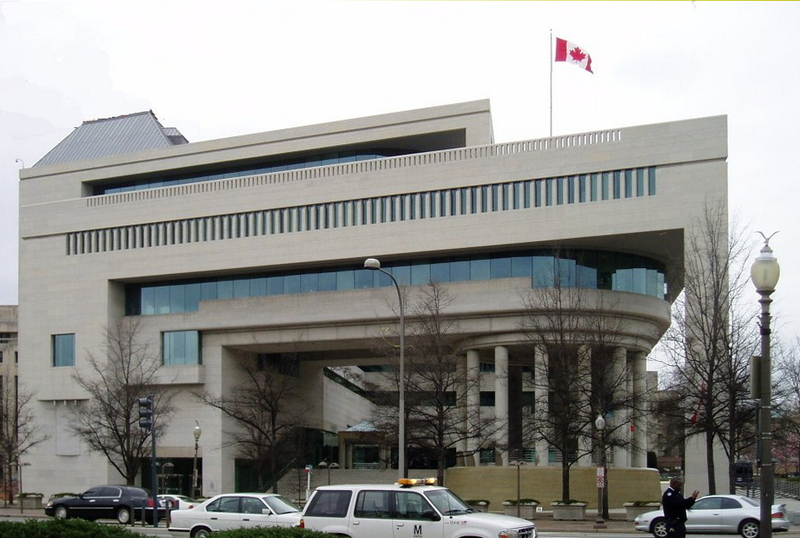 Modernist buildings haven’t really stood the test of time, I have to say, especially those designed to look like concrete bunkers, such as the Canadian Embassy. SFU is one of the most depressing places in the world on a cloudy, rainy day atop Burnaby Mountain. Unfortunately, it is often rainy and cloudy atop Burnaby Mountain. University campuses across North America are dotted with modernist buildings, as the great boom of construction on these campuses came at the height of modernism in the post-War era. 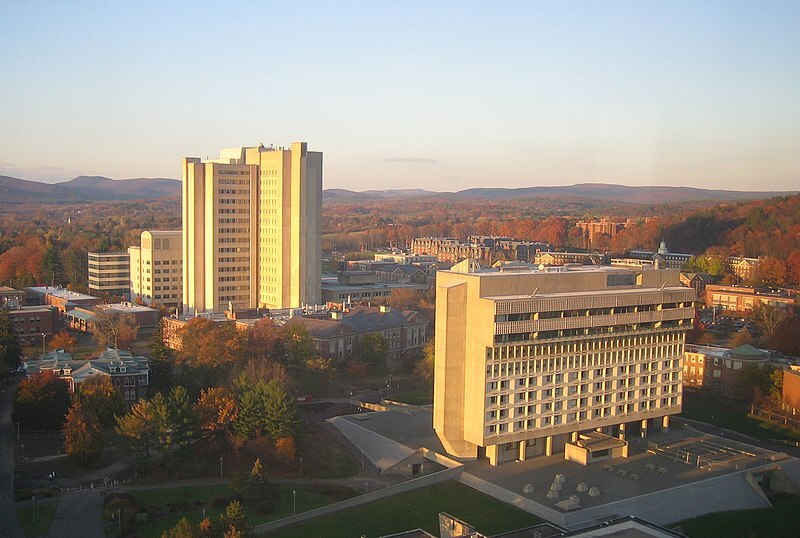 In many instances, modernist behemoths look as if they were dropped into more classical settings, such is the case of Student Center Building at the University of Masscachusetts, Amherst. In the picture below, you can see those older, classic buildings scattered around the Student Center and the residence towers behind it. So pervasive is modernist architecture on campuses that it is oftentimes pejoratively referred to as “Neo-Brutalist” architecture. Indeed, buildings such as the Student Center, or the entire Burnaby Mountain campus of SFU, re-enforce this. The buildings are concrete, massive, and imposing. Inside, there is a lot of dark browns, dark woods, and black. Gloomy is about the only way to describe these interiors. 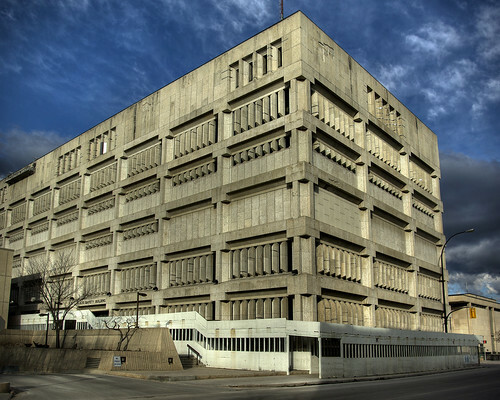 Long and short, the term “Neo-Brutalist” quite often fits, not that there aren’t some beautiful modernist buildings to be found, such as Vancouver’s old BC Hydro Building, which has since been condofied, or MOntréal’s Palais de Congrès. But, despite this, I can’t help but chuckle when I read stories like this one in the Globe & Mail yesterday, about the Public Safety Building in Winnipeg. brittle Tyndall limestone, hasn’t held up against Winnipeg’s climate. Dozens of steel brackets cling to the building’s exterior like Band-Aids, preventing the facade from avalanching into the street. A $98,000 awning encircles the building, stopping pieces of the gaudy structure from braining pedestrians. 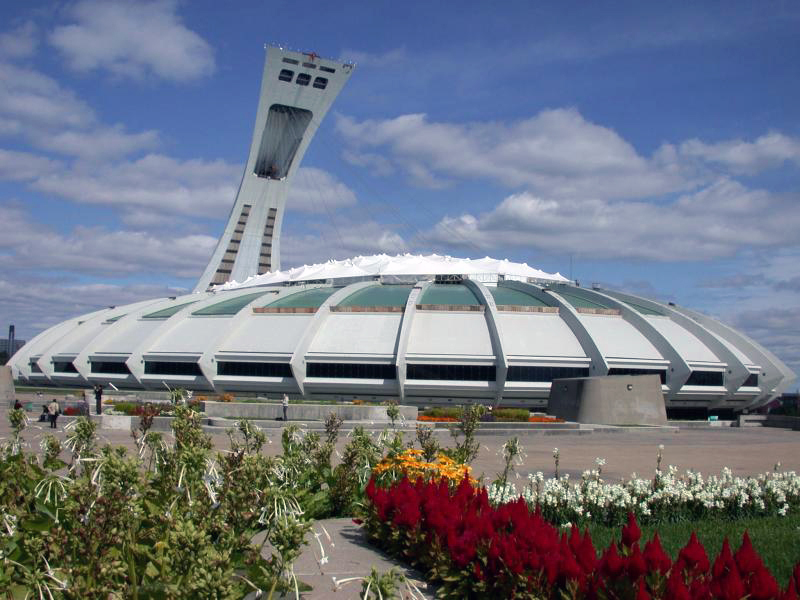 And this is the crux of the problem with many Neo-Brutalist behemoths, from SFU to Montréal’s legendary Stade Olympique, known in English as the “Big O”, or more fittingly, the “Big Owe,” as it took 30 years for the city to pay off its legacy from the 1976 Summer Olympics, by which time the Expos had decamped for Washington and the Alouettes had been re-born in McGill University’s quaint Molson Stadium at the foot of Mont-Royal. But the Big Owe and the PSB, and SFU, for that matter, all have something in common. The materials used to build them aren’t all that well-suited to the climate they are in. Hence, the PSB is falling apart, the Big O has had large slabs of concrete fall off it, and SFU, well, that much concrete in a rain forest isn’t the best idea, either. It’s not a love-hate relationship people have with these buildings; it’s just hate. People grew up with these buildings and don’t see them as heritage buildings, but the same thing happened 40 years ago with Victoria structures. Had we ripped out every Victorian building in the country we would be very sorry these days,” she said. “And these are the times when they become vulnerable. The country is coming out of recession and people are gearing up to tear things down. Personally, I’m not so sure that a modernist building is worth saving just because of its own merits. A building like the PSB is an ugly imposition on the urban landscape. Buildings like it seem to mock their landscapes, they don’t fit in, they crush them, they impose upon them. They belittle us. Of course, granted, that’s the point with a police station, or at least it was in the 1960s. But that doesn’t mean a building should be saved just because it’s old. Sometimes, old things are just junk. And the PSB is an example of that. This is entirely off-topic, but: the Winter Olympics in Vancouver are coming up next month. And this is Canada. In Canada, we expect to win every gold medal on offer in international hockey. We do win a lot. Just not in men’s international hockey. At least not in the Olympics, with only 2 in the past 60 years (1952 and 2002). In 2006, Canada bombed out of the Olympic men’s hockey tournament in most embarrassing fashion. Anyway, I digress. For this year, Pepsi and Hockey Canada have teamed up to commission an “official” chant for the fans. Yes, that’s right, “they” want to tell “us,” the fans, what to chant at a hockey game. The chant, moreover, is so godamned lame it’s not even funny: “Eh! O, Canada Go!” It’s being test-driven at the World Junior Hockey Championships in Saskatoon right now. One word: Awkward, try saying it yourself. Go on. Seriously, an “official” chant for the fans. One coming from a marketing campaign. I can’t even begin to tell y’all how much that depresses me. You are currently browsing entries tagged with olympics at Matthew Barlow.